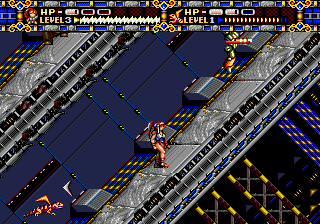 Alisia Dragoon is an overlooked platformer/shooter for the Genesis/Mega Drive, published by Sega in early 1992. It sported a relatively small release compared to other Mega Drive/Genesis games, and is among one of the harder cartridge titles to find, especially in Japan. 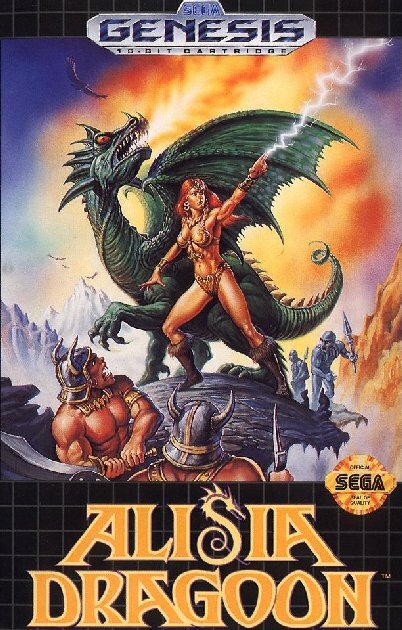 The generic fantasy artwork on the cover of the Genesis version probably didn’t garner it much attention, so it was mostly ignored at the time. However, Alisia Dragoon has built up a cult following in both countries. 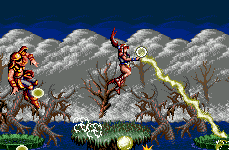 The gameplay is solid, and fairly unique for a side-scrolling action game. It also feels like something that could have been done by Wolf Team (incidentally Alisia bares a fair resemblance to Annet from El Viento). 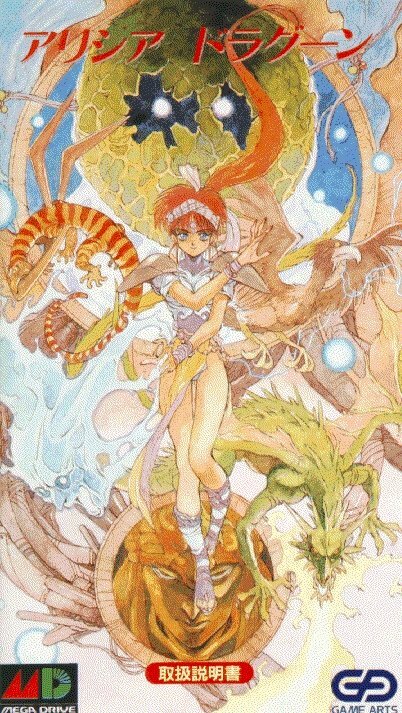 It was actually developed by Game Arts, who would eventually go on to create the Grandia and Lunar series. It was also produced by the anime studio Gainax, of Neon Genesis Evangelion fame. Most of the story unfolds only in the instruction manual. Alisia’s father was a mage who fought against the dark god Baldour, who has visited Earth for all kinds of nefarious purposes. Alisia’s father was captured and murdered before her very eyes by the dark god and his right hand man Ornah, Because they failed to read the Top Rules 100 Rules of Being An Evil Overlord (Rule #31: Don’t let the offspring of your victims live so they can exact vengeance down the road) Alisia was left to grow up, become a magician of great power, and eventually challenge his rule. 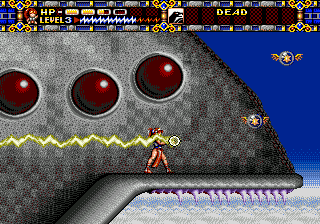 The game starts with Baldour’s cocoon returning to Earth, forcing Alisia to pursue Ornah and his master across eight stages to seek her revenge, and hopefully destroy the cocoon before it hatches again. Alisia has one basic attack – her thunder magic. Simply holding down the attack button simply directs her attacks towards the nearest enemy. This basic method of attack is identical to Thexder, an earlier action game by Game Arts developed primarily for PCs. However, there is a power meter for your magic, so you can’t just hold down the button and charge forward. If you run out, you’re left defenseless for a second or two, although the meter recharges rather quickly. If you let it charge up fully, you can do a “rolling blast” attack that usually clears the screen of lesser enemies. 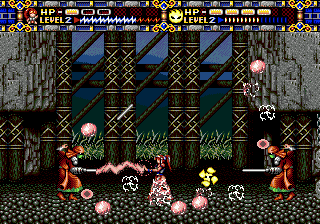 Compared to other games, controlling Alisia is a bit difficult, considering you don’t really need to aim your attacks. You just run forward, turn around to attack behind you, jump over some bad guys, then continue. This may sound easy, but the game tosses tons of bad guys for you to deal with – by the end of the game, you’ll be fighting enemies nearly nonstop. Many of them will just materialize out of thin air and start attacking, forcing you to stay on your toes. Most take several hits to kill, and dodging them can be quite difficult. Amidst all of the chaos, you need to be mindful of your magic meter, lest you end up being unable to attack. 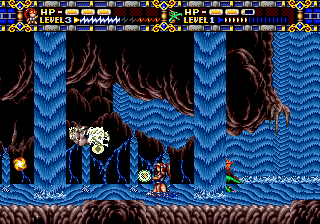 The game also features spectacular boss battles, all of which are varied and challenging. The only problem, one might argue, is that they are very pattern dependent and can grow tedious upon replays – once the pattern is learned, the challenge disappears. However, the final few fights, screwing up just a little bit can be fatal. In addition to all of the enemies, there are also traps in various stages such as moving platforms, hot lava, and discarded munitions that explode when struck by magic. 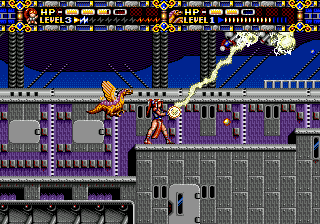 Perhaps to help you in the difficulty the game poses, Alisia can call on four mystical companions to come to her aid: a dragon which shoots flames, a living fireball which acts as a shield and rams into enemies, a lizard that shoots out boomerangs, and finally the thunder raven, which emits a screen wide flash that damages all enemies. Each of those have their own life bar, and a power meter that determines how often they can launch an attack. Alisia can only have one active at a time, though cycling through them can be done with the press of a button. Unfortunately, other than selecting your animal pal, you don’t have any direct control over them. 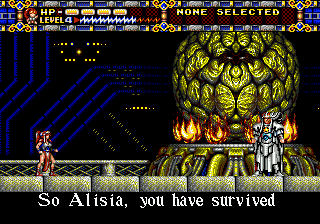 Both Alisia and her companions can be powered up by collecting special icons hidden throughout the stages. 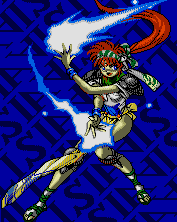 Alisia begins with three life bars and can have a maximum of six, and her lightning can be powered up eight levels. Although the game is tough, Alisia can take quite a bit of damage before giving up the ghost. 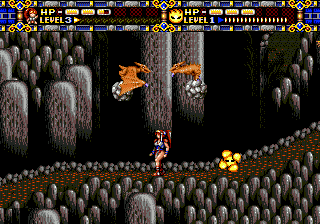 Her animal companions have three levels apiece, gaining both additional attacks and extra life bars. There are many other power ups scattered about as well, such potions which heal a whole health bar for Alisia, and meat, which heals a whole bar for her companion. There are 1-Ups scattered along the way, along with special fairies, which grant miscellaneous special effects like invincibility or unlimited rolling thunder attacks for a short time. Power ups only appear in special containers which become visible when you get close to them, putting a key focus on exploration. 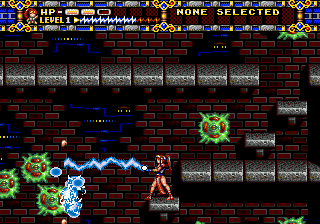 In the first level alone, you are strongly encouraged to poke around for false or destructible walls to locate necessary power ups. The levels are expansive, with various nooks containing items or secret passages, and in some stages, you can take multiple routes to reach the end-level boss. 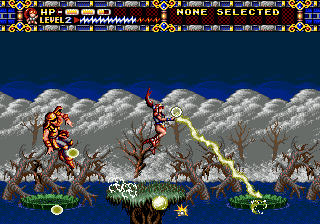 Although Alisia Dragoon has two modes of difficulty, even on normal mode, it is a challenging game to get through. Alisia has one life at the outset, and when she dies, it’s game over. 1-Ups act as continues in this regard, allowing you to start from the beginning of a stage. Should one of your familiars die, they will stay dead until a revival power is found, in which case they start again at the lowest experience level. As mentioned the game sports excellent graphics, but the sound ranks among my own personal top 5 Genesis sound tracks (the other slots are owed to Ys III, Castlevania: Bloodlines, and the Phantasy Star games). and it is wonderful! 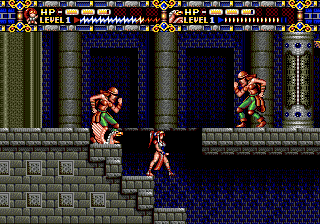 The graphics are colorful and fairly crisp for a Genesis game. 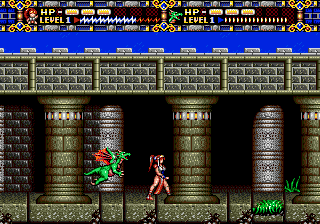 The backgrounds, be it ancient ruins, underground caverns, or a flying citadel, are well drawn and set the mood for the game, and the animations for Alisia and her enemies are smooth as well. There are no passwords or saves, though the game can be beaten in about an hour or so of casual play. There is a debug code that can be used to skip around levels, become invincible, or power up Alisia, though using this denies you the opportunity of seeing a special status screen charting your progress, accuracy, and giving you an over all ranking based on how far you got in the game. Despite its difficulty, Alisia Dragoon is surprisingly well built and fun to play. While it’s just another platformer/shooter for the Genesis, it’s still fairly unique in what it does and is worth checking out.